Care for health â€¢ bloom beautiful! 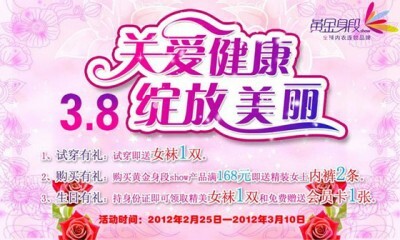 February 25, 2012 - March 10, 2012 3.8 During the Women's Day, you will be able to participate in the following activities when you show the national chain stores in the golden stage . First, try on courtesy: Trying on the store try to send a pair of female socks. Second, the purchase polite: Non-member who went to the store to buy the whole show golden figure show full 168 yuan gift box gift box two ladies underwear. Third, members courteous: Members to the store in addition to continue to enjoy 8.8% discount, the purchase of gold section of the show full of 168 yuan product that is sent to the gift box two ladies underwear. Fourth, birthday polite: Any customers on the March 8 birthday, ID card holders can receive a pair of beautiful women's socks and a free membership card.